I found this cute shamrock pin pattern here and instead of using glue to apply the pin, I sewed the pin to the shamrock. The pins can be found at Michaels and A C Moore stores. These could also be sewn to a snap barrette which you can locate at Dollar Tree Stores. Super cute! I like how instead of using glue, decided to them onto the pins. I think it's a much more stable option. Great job. Love these shamrock pins. If you have not linked them up to the Go Green Giveaway event yet, I would love for you to do so for a chance to win. I love these! My sister crocheted a shamrock for me years ago and I have been looking for a pattern. I am so excited to find this one! Thank you for sharing! Hi there! Just popping in to tell you I featured your adorable shamrock hats on Destination: Inspiration linky party going on now at Teagan's Travels! Hope you have time to grab a featured button and post more of your awesome-ness! This is funny - my mother in law made me one of these 30 years ago and I wear it once a year!! and I always get comments on how cute it is! These are so cute! What a great idea and just in time! Thanks for linking up to Making Your Home Sing Monday. What super fun shamrocks! I'd love to have you link these up to my Springtime Holiday Link Party! Not a kid person, but that shamrock hat is adorable! I haven't crochetted in forever. I have twenty dishcloths I promised to people that still aren't done in over a year! LOL Too much to do and not enough time. I also scrapbook and write. Writing is my main thing. And photography. And watercolor. Hopping for Shah's Weekend Creation. I have a short story, The Telling Place posted. 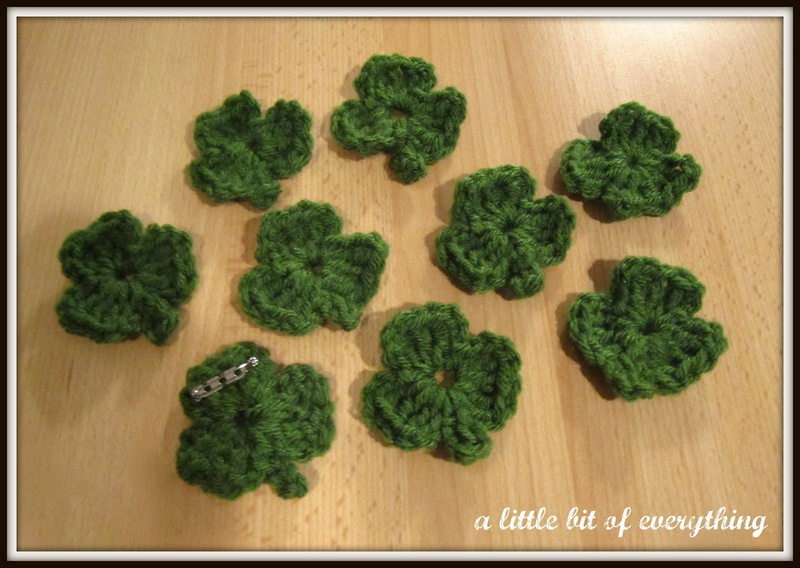 Who wouldn't feel absolutely lucky wearing one of these beautifully crafted shamrocks? Thank you so much for sharing your talent at Rook No. 17. It's always such a pleasure to have you! So cute and easy too! Thanks so much for sharing at Taking A Timeout Thursday! This is so cute. I love the idea of making it into a barrette for the little ones. I love your little shamrocks, I think they would make a great garland. Thank you, My MIL use to make these for my kids when they were little. What a wonderful idea! If you don't feel like wearing green, pin it up and nobody can pinch you, LOL. Thanks for sharing at Thursday Favorite Things! No pinches for you with those cute pins! Thanks for sharing them with SYC. These are adorable! Thanks for visiting and I am now following your blog. These are so cute! thanks for sharing at the Creative Collection! The shamrocka re super cute, they can be sewed tgo many other things like decoration. happy St. Patrick's day!